We have another new items out which tailored for professional user (especially competition user). 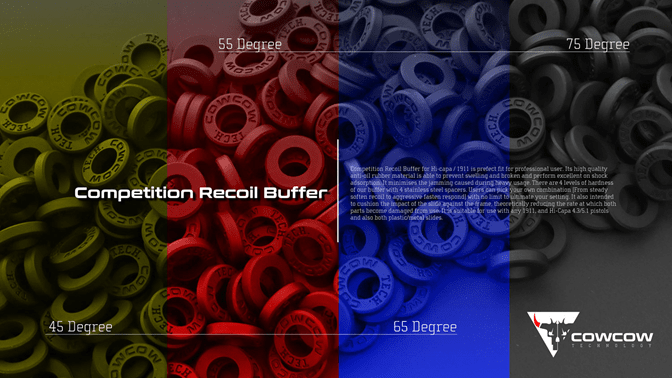 They are Competition Recoil Buffer Module and HopUp Bucking Combo. Competition Recoil Buffer Module is produced by high quality anti-oil rubber material which is able to prevent swelling and broken and perform excellent on shock adsorption. It minimises the jamming caused during heavy usage. There are 4 levels of hardness (45°Yellow/55°Red/65°Blue/75°Black) of our buffer with 3 stainless steel spacers in a package. Users can pick your own combination (From steady soften recoil to aggressive fasten respond) with no limit to ultimate the setting. It also intended to cushion the impact of the slide against the frame, theoretically reducing the rate at which both parts become damaged from use. It is suitable for use with any 1911, and Hi-Capa 4.3/5.1 pistols and also both plastic/metal slides. 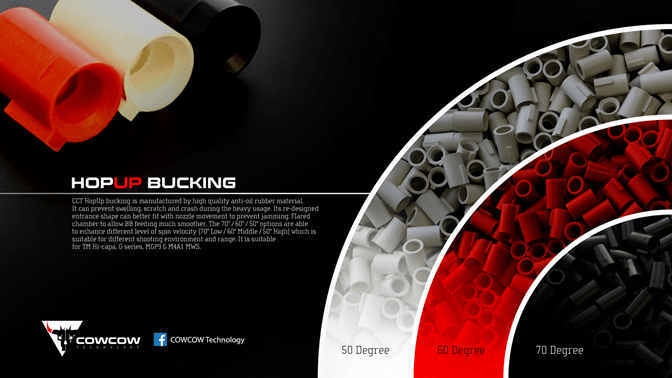 HopUp bucking Combo is manufactured by high quality anti-oil rubber material. It can prevent swelling, scratch and crash during the heavy usage. Its re-designed entrance shape can better fit with nozzle movement to prevent jamming. Flared chamber allows BB feeding much smoother. There are 3 levels of hardness (50°White/60°Red/70°Black) in a package. Those options are able to enhance different level of spin velocity (70° Low / 60° Middle / 50° High) which is suitable for different shooting environment and range. It is suitable for TM Hi-Capa, G series, M&P9 & M4A1 MWS.